Whether from a private customer, a commercial company, school or a parish council, we are always grateful for feedback on our work. Please leave your own comment below. Richard and Sam are so professional in their approach and work. They worked all day here to trim trees, cut back wisteria, trumpet vine, jasmine hedges etc. The shape of the tree is now just perfect. We are just delighted. They cleaned up so well as well! We will have them back next year and recommend them to all our friends and neighbours. Thank you! This company is brilliant, the work was excellent and absolutely no mess, I would have no hesitation in using them again or recommending to anyone. Richard’s knowledge gave me the confidence that this was a very professional company. 5 stars!! I would highly recommend Tree Profiles. I was very impressed with how quick and efficient Richard was with the visit and quote. The team arrived and worked very hard to remove two trees and trim down an overgrown garden. I was impressed how tidy the garden was left and I would definitely use them again. Five stars! Richard was really helpful came out within 24 hours to fell a tree in my back garden. They did an excellent professional job. Everything was cleared away and they even put the cat fencing back in place! I would have absolutely no hesitation in recommending Tree Profiles. Many thanks. Excellent service – very efficient. Returned phone calls and sent a quote for the work very quickly. Our garden was left clean and tidy. Would definitely use them again. I have found Richard and his team to be courteous, helpful, competent, reliable and efficient. When they arrived they moved everything that could be damaged by falling branches and in no time had scooted up the tree to start removing the smaller branches. Before long, the tree had been removed to ground level, as agreed. A groove was cut into the top of the stump, a special preparation was brushed on, and then a 75mm ‘washer’ of trunk was carefully placed over the cut to keep it away from animals, birds and the weather. Finally all wood was shredded, every trace of debris removed and the items that had been moved initially were carefully replaced. No doubt there are plenty of ‘cowboys’ who will do this work more cheaply, but, based on this job for me, you won’t get it done any better or more pleasantly. If I needed further work I wouldn’t look any further. And, no, I am not on commission! Absolutely fantastic job from start to finish! 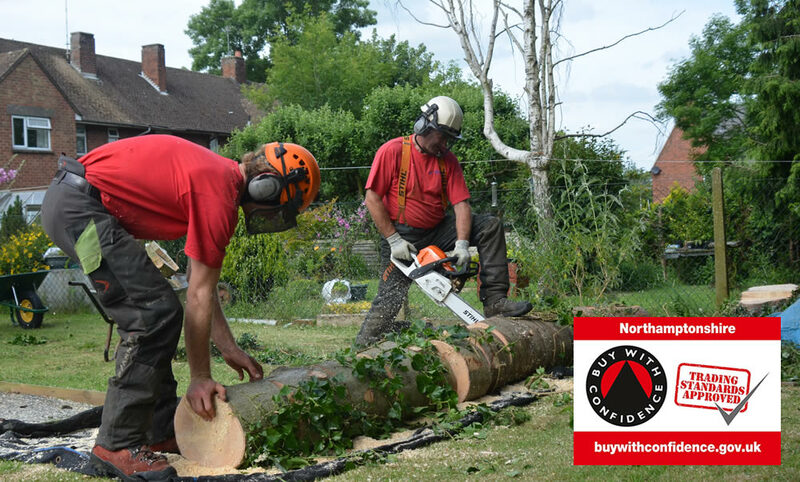 Richard and his team (Sam and Matt) delivered most competent, professional, knowledgeable and swift dealings with the tree work necessary. Have already highly recommended them to new neighbours and will definitely book them again for upcoming tree works. Thank you, Tree Profiles, for your brilliant service :-)! Five Stars! We were absolutely delighted with the work Richard and his team did for us. Totally professional from start to finish. Our tree work was done swiftly and efficiently by the very courteous team who left everything tidier than it was before. A brilliant job, well done. We will highly recommend Tree Profiles Ltd. to anyone who needs tree work. Many thanks again to Richard and his team. Richard and his team did a great job removing a large Leylandii hedge from my garden. Swift and friendly service, and everything carefully cleared away afterwards. Highly recommended! Richard and his team came to remove a huge horse chestnut tree from our Glebeland which had become diseased and had to be felled as a matter of urgency. They carried out this work swiftly and efficiently and the result was fantastic. I would have no hesitation in recommending Tree Profiles, and whole-heartedly agree with all the other comments below. Well done. Richard did a great job on our overgrown trees and shrubs, he was completely professional from start to finish, he listened to the requirements of the job giving advice when asked. On the agreed day Richard arrived with Matt & Samantha and they all worked really hard to ensure the job was completed by the end of the day and left everything clean and tidy. A great job well done!! Very helpful and pleasant excellent work we would highly recommend them. Following the initial contact with Richard Lester the visit, quotation and the subsequent work was carried out without any fuss or delay. The price was good and the work was completed very professionally as per my requirements. I would highly recommend Tree Profiles. Thank you Richard for your excellent service. Richard and his team removed 3 tall conifers from my land. They did so quickly and efficiently, removing both visible stumps and all waste. From quotation to completion of the job, Richard was helpful, prompt and made the whole process hassle-free. We have just had Richard attend our house from Tree Profiles as to whether our silver birch needed to be removed, but there is still some life in it which we were so pleased to hear. We would like to thank Richard again for all his advice and he was very helpful as to what we need to do in the meantime. Thank you once again for your professionalism and would have no hesitation in recommending Tree Profiles. Very professional, did an excellent job of pruning our crab apple tree. Tidy and efficient, left no mess. Also listened to what we wanted to achieve with the pruning and gave their own professional advice. Will definitely use again. I have 2 Himalayan birch trees that were looking very droopy and a bit sick. I contacted Richard (Tree Profiles) and explained the problem to him. Richard went out of his way to visit me and check the trees. Luckily he said there was nothing wrong. In all respects, his attitude was totally professional and I am sure that if I had needed work done this would have been carried out in a similar professional manner. Thank you Richard for your approach and advice. If at any time I need work done on trees, I certainly know who I will contact. Richard and his team carried out some work for us yesterday. They trimmed down three trees and removed some unwanted bamboo plants. Throughout their visit, they were very professional in how the work was carried out. They were also very courteous and kept us informed of what was happening throughout the visit. The end product was exactly as we wanted and our trees really do look good now. They were very careful with the rest of our garden and tidied up very well before they left. Definitely recommended! Very efficient, quick and easy removal of our tree. Lots of communication to arrange dates and times. Definitely recommend. I would not hesitate to recommend Tree Profiles. Richard and his team did an efficient and professional job in felling and removing a large tree from my garden and I am delighted with the result. Richard worked on my ever growing and over productive old apple tree and he brought it back to good health by trimming it and giving it a good shape. He is a very careful and conscientious worker and I thoroughly recommend him – thanks very much Richard. We were very pleased with the work done on our large hedge & the three trees. The garden was cleared carefully & everything looks good. We are happy to recommend Tree Profiles & will certainly use them again. This is the 4th occasion on which we have called upon Tree Profiles. Richard is always prompt with a response and he dealt with the problems immediately. A number of very tall trees were shaped and tidied, Others pruned and brought back under control. He and his assistant worked swiftly and professionally together even at the latter stages in the pouring rain and as always cleared and tidied up after themselves taking away all rubbish and leaving the garden in as near perfect state as possible. Thank you Richard. We have had 4 stumps ground and removed cleanly and you would never know they existed in the first place. Richard is a very friendly and professional person and we would have no hesitation in recommending his services. Thank you Richard. Very professional service. Quality work and happy neighbours. I’ve used Richard and his team for a number of years and would recommend him to everyone. Richard and his team have done a superb job under difficult circumstances taking down a lot of overhanging branches. They were polite, efficient and very tidy, would recommend them to anyone without hesitation, 10 out of 10. Very professional from start to finish. Came out promptly to survey work and gave very good advice where an ash tree needed some bough’s removed. Quote arrived promptly and work schedule adjusted to fit in with our program. Arrived early on the day of work and then cracked on. Very professional throughout the whole operation and completed a most satisfactory job. All the wood was cut up into small perfect logs and they even used their axe to make the logs the right shape and size – that’s service. They took all the ancillary waste and tidied up perfectly afterwards – even my wife was happy that there was no mess!! I would recommend Tree Profiles to everyone.